It’s been so fortunate for me to be able to travel for work and play quite a bit the past few years. I’ve picked up a few habits and items along the way that have helped make my trips as seamless as possible. Today I wanted to share one of my go-tos - because it’s had such an impact on making endless trips through airports so much easier - hope it will be useful for you as well! 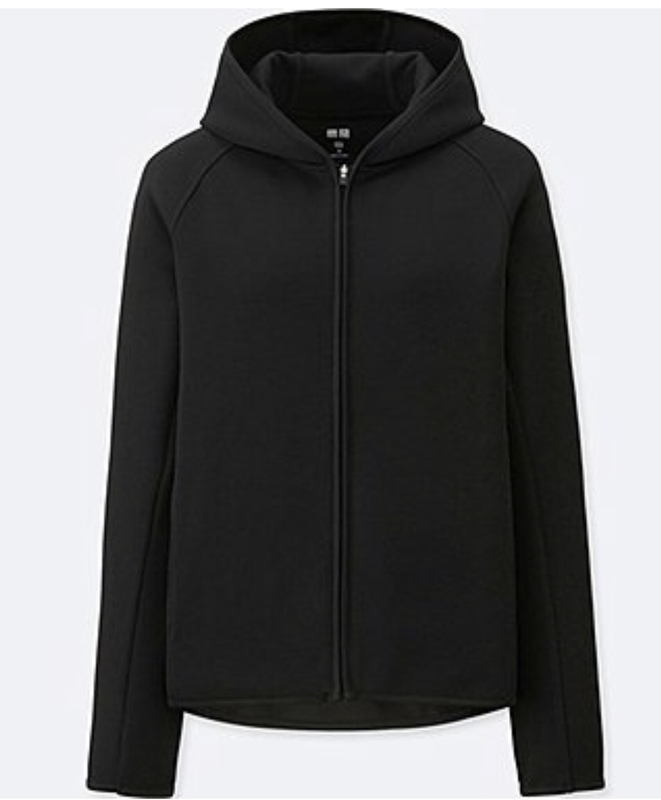 May I present: the Uniqlo hoodie. Why do I love it so? 4. Water resistant and hooded, it doubles for cover during light rain (so you don't have to juggle an umbrella while trying to wrangle luggage, if any part of your trek to/from ground transportation is open air). Also stain resistant. All of which I need immediate access to for my settle in routine on a flight. I then don’t have to hold up everyone coming down the aisle by digging for them in my carryon before stowing into the overhead bins, nor irritate row mates rummaging through my bag. Of these, THE most important feature is that the inner pockets on both sides are vertical offering convenience, safety and security at the same time - most hoodies only have the diagonal slit pockets outside, and that would put me in constant fear of items dropping out in transit, or the zipped diagonal slit pockets are not deep enough to fit the passport at all. Not only are the inner vertical pockets perfect storage spaces that allows me to conveniently access my passport/ID for counter agents, TSA, gate agents and customs officers/kiosks as needed, while being confident that that crucial travel document is not going to tumble out of my pocket unless I do something crazy like cartwheel through the Terminal...(yeah I'm nowhere near athletic enough for that anyway) the placement inside the hoodie adds another layer of security. Once you zip your hoodie up, you’ve made it harder for people to pickpocket your passport. Of course, the familiar outside pockets are still available to keep hands warm. You can find it in-stores or online at Uniqlo. Also, Deal Alert: Get $10 off your order of $75+ when you sign up to receive Uniqlo emails. Always on the lookout for great, authentic Hong Kong food in LA, I was excited to find recently several of my favorite staple dishes and drinks at Ho Kee Cafe! Like most fantastic food finds in the SGV, Ho Kee firmly focuses on their food vs. ambience, though the cozy space does have its own charming touches like roof-facades over main counter areas inspired by traditional temple architecture. My favorite dish here is the revelatory Wonton Noodle Hong Kong Style ($8.95) - the best wonton noodle soup I've had in LA thus far. I'll ask for you to kindly excuse the blatant use of foodporn vocabulary here, but the measure of a good wonton to me are the ration of filling to skin, and then the quality of both as indicated by texture and flavor. And Ho Kee's is fantastic on all fronts: super fresh, robust, springy shrimp with nice clean snap is in perfect proportion to the supple, thin wonton skin that is skillfully crafted so that it does not fall apart on pickup. The chefs let the fresh juicy savory sweet flavors of the shrimp shine through, with just a touch of pepper to spice things up to just the perfect level. Noodles are perfectly cooked so that they are not too chewy/ tough and not too soft, but perfectly springy and clean, comforting soaked in steaming hot clear broth. The cafe fare is ordered a la carte and readily available. But Ho Kee also offers a 'Private Kitchen Menu' of higher end dishes that typically requires advance order. However, when possible they will make a few of the dishes from this menu available without that pre-planning. I was lucky enough on the night of my first visit to be able to try from the Private Kitchen menu: Razor Clams ($43). I haven't seen these on many menus around town, and was excited to see that the preparation is similar to what I had at famed Tung Po at Java Road market in Hong Kong. The slender beauties are steamed in clear broth and topped with fried garlic and scallions for punches of flavor and texture contrast to the soft yet structured clam meat. Below the razor clams, a layer of glass noodles to soak up all the delicious juices and flavors. Pretty pricey, and not something to be repeated often, but beautifully cooked. This one is best ordered with a larger group to share, so that you can order other dishes as well to experience. Back on the regular menu, I'm also a fan of the Two Kinds of Meat ($12.95) plate, where you can choose from among their housemade barbecue items. I chose roast duck and char siu. The duck had flavor intensity, and fantastic crispy skin with a pleasing layer of fat below for that perfect crisp juicy umami explosion in your mouth. The barbecue pork was great as well, but not as unforgettable as the duck. For those who are singular in their love of certain barbecue meats, you can order single types too, like the Roast Duck Plate ($9.95). Lastly, what Hong Kong cafe with any pride would not also offer a great milk tea? Ho Kee offers a very fragrant, silky creamy milk tea that I love, and also another Hong Kong iconic drink, "yin yang" or Milk Tea Coffee Mixed (Hot) ($2.95) on the menu. I liked the milk tea better. Most diners around you will be speaking Cantonese, a good sign of authenticity of cuisine - the restaurant is attracting those who have roots in Hong Kong. And indeed, when I eat here it feels like home.